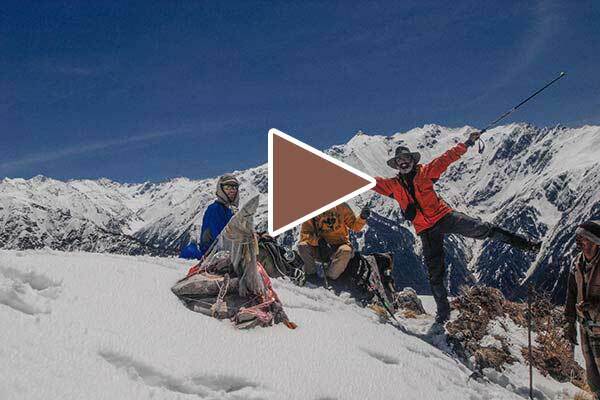 Get yourself introduced with the Tirthan valley ! 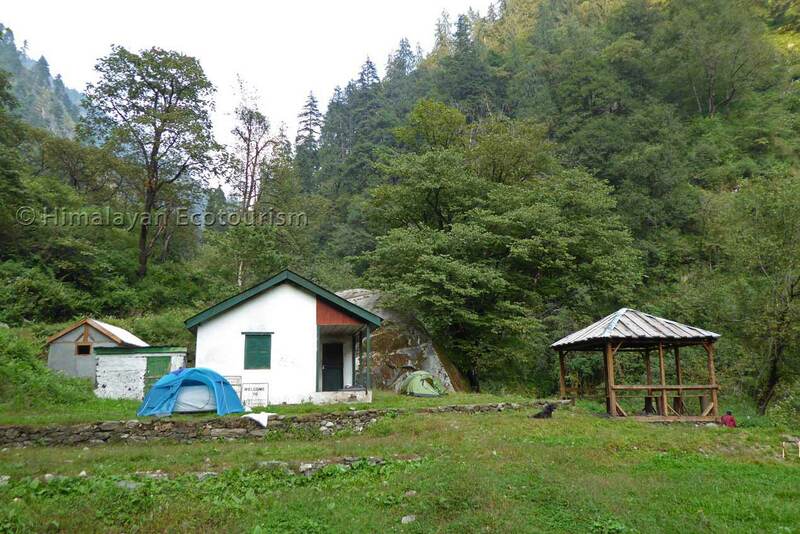 Himalayan Ecotourism class on an alternate campsite ! 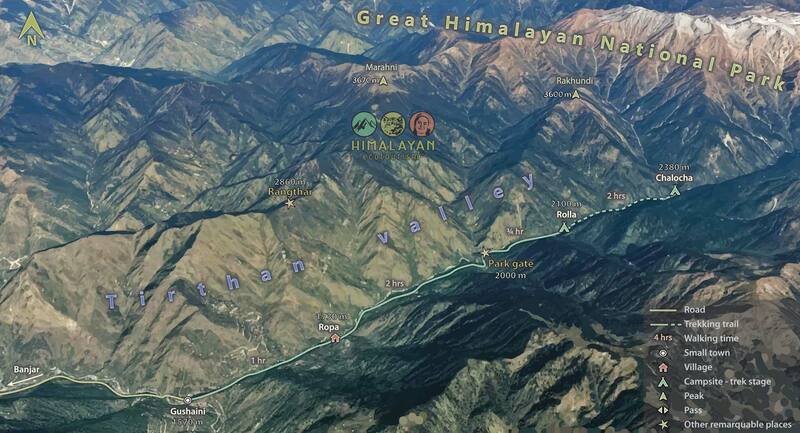 Rolla Trek is the shortest and easiest trek going inside the GHNP. 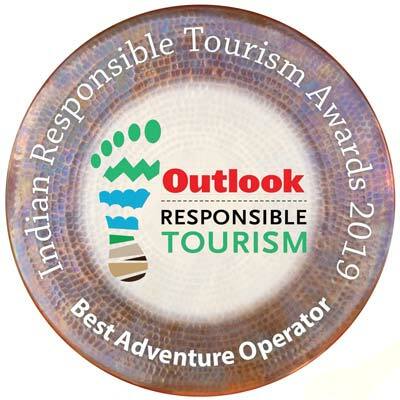 In case you have only two days for trekking Rolla is actually the only option with Rangthar. Please check also the Trek to Rangthar in the Great Himalayan National Park to know which one you would prefer. 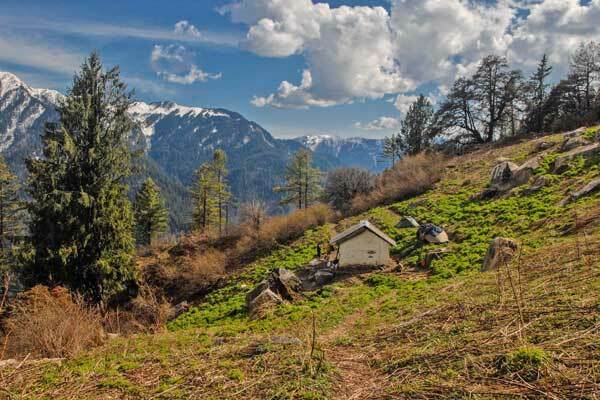 Rolla is also a good trek for first-timers to trekking, though you may consider to go up to Shilt hut if you have one more day. The trek begins at the road-head Gushaini. 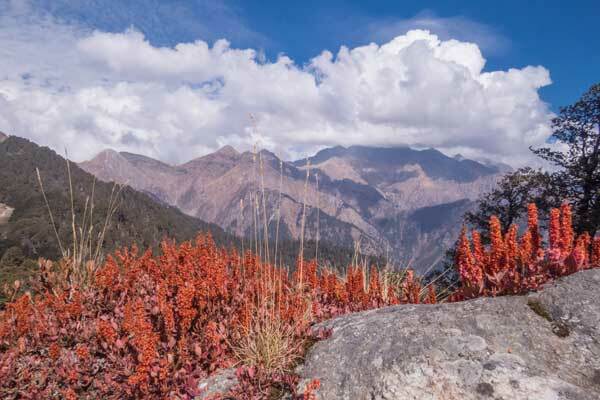 From there, you hike through the ecozone of the park along the Tirthan river to the reach the park gate where the national park begins. Rolla is located 30 to 45 minutes walking distance from the Park Gate. You wish to go further ? Then you need to add at least one day to your trek :-). 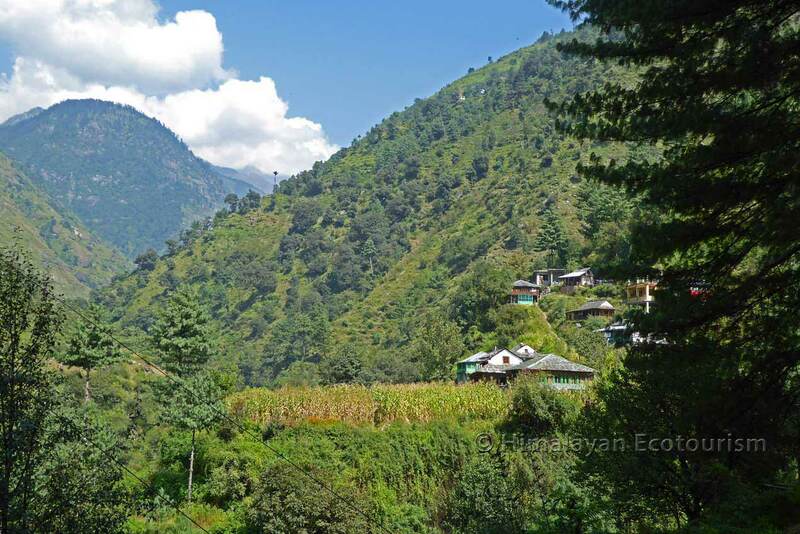 A very good mountain trail following the Tirthan river takes you up to the village Ropa. Then it continues upto the Park gate gradually taking you in a wilder environment. After the gate you remain very close to the river up to Rolla. Nothing very steep on this trek. The path goes up and down toward the Park gate through some nice forests. From the Gate to Rolla you are with the chanting river in the wilderness of the GHNP. Best time to trek to Rolla is March, April, May, June, and then October and November. You can also consider July, September and December. We even had trekkers to Rolla in Jan and Feb ! The trek starts from the village Gushaini where we have our office. 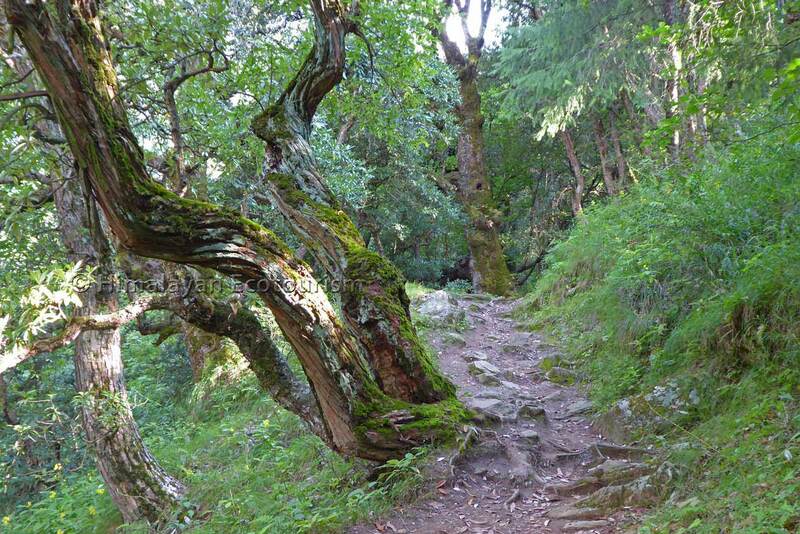 After being introduced to your trekking staff you follow the path giving way to the remote villages of the ecozone. After about one hour you reach the village Ropa where you may consider having your lunch if it is the right time. As your trek is in progress the human population decreases and nature turns into natural wilderness. You go through the village of Ropa and then the tiny Kauncha. 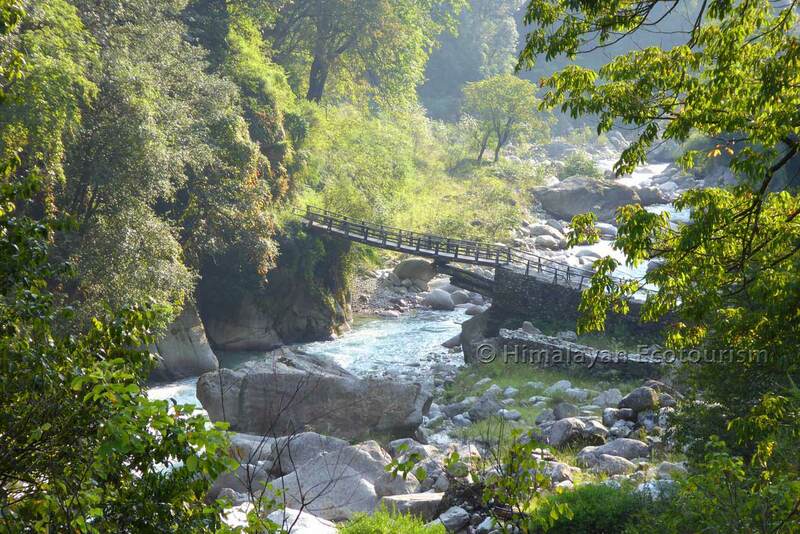 After walking for 3 hours along with the Tirthan River you reach the park entrance gate. As you cross the park gate you are in the realm of Nature. On your way to Rolla, you will only come across one old wood house where lives the last inhabitant of the Park, Nanni, an old lady who refused to leave the place. Ahead of Nanni's house the path gets narrower and forest will become denser. You can enjoy the diversity of plants and tree species. 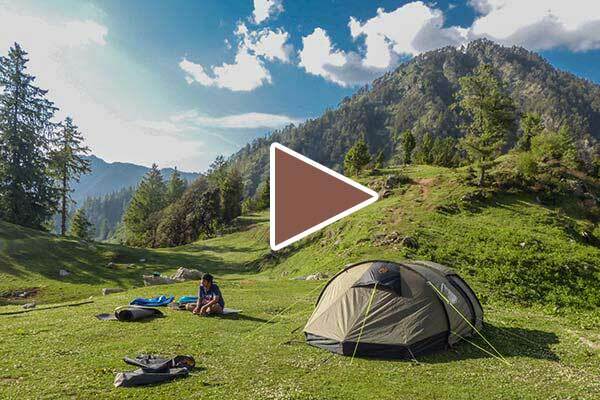 After hiking for half-an hour from the park gate you will reach the Rolla huts and campsite. Once the tents are pitched you will receive a delicious snack, and enjoy the riverside location of the camp. During evening at the river bank you may encounter wildlife coming to drink water from the river. It is commom to see monkeys and langurs, but even leopards have been spotted ! 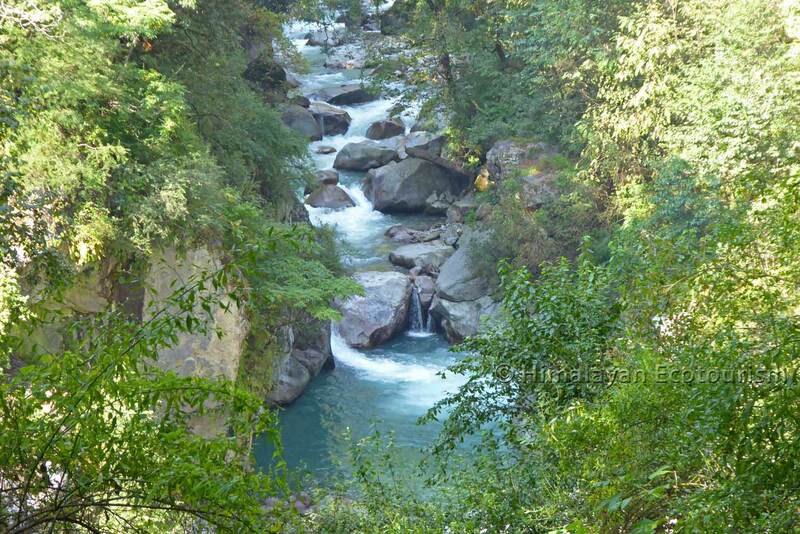 Wake up with the sound of the Tirthan river. No hurry you can even have your lunch at Rolla before going back to Gushaini. You go down via the same way to the Gushaini where you are welcome for a tea at our office. 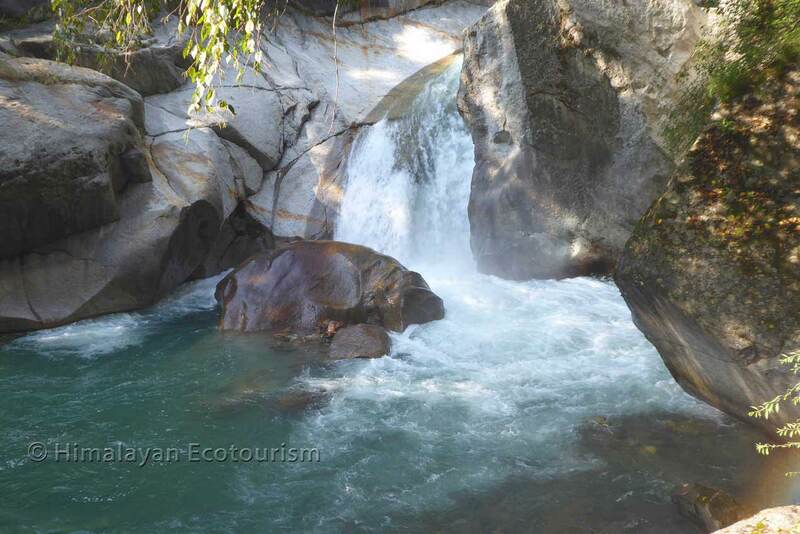 The Tirthan river will be your companion during the entire trek. The rock shape in the middle of the stream reminds a bathing hippo ! 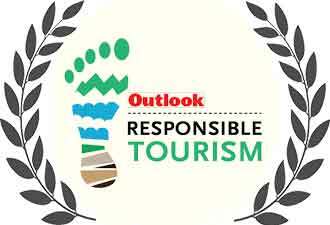 Enjoy the nature and its biodiversity on the way to Rolla. After about one hour you cross the traditional village of Ropa. Have a chai break ! Rolla campsite has a couple of huts on the campsite.